Microsoft has a Windows XP problem: people still like it and aren't willing to upgrade just yet. So it's warning users that if they don’t upgrade soon, hackers will lie in wait each new Patch Tuesday to reverse-engineer a full set of new vulnerabilities. "The very first month that Microsoft releases security updates for supported versions of Windows, attackers will reverse engineer those updates, find the vulnerabilities and test Windows XP to see if it shares those vulnerabilities," said Tim Rains, Microsoft's director of trustworthy computing, in a blog post. "If it does, attackers will attempt to develop exploit code that can take advantage of those vulnerabilities on Windows XP. Since a security update will never become available for Windows XP to address these vulnerabilities, Windows XP will essentially have a 'zero day' vulnerability forever." He points out that from July 2012 through July 2013, Windows XP received 45 patches, 30 of which were relevant to Windows 7 and 8 as well, and there is considerable flaw cross-over found among the three operating systems. XP is also by far the most malware-infected operating systems, he points out. Hackers have learned to get around XP systems like Data Execution Prevention (DEP), Rains warned, although it has forced attackers to up their game somewhat. The threat landscape has also changed significantly since the last service pack for XP came out in 2008 – five years is a very long time in the malware industry, after all. Windows XP, despite being 12 years old, is still Microsoft's second most popular operating system with 37.2 per cent of desktops compared to 44.5 per cent for Windows 7. 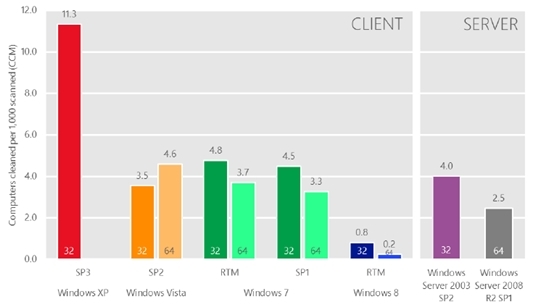 Don't ask about Windows 8 – that has only just overtaken the much-reviled Vista. Despite the ending of free XP security updates on April 8 of next year, Rains says he still meets businesses that run XP on some systems and plan to continue doing so until the hardware fails. According to recent data, 15 per cent of IT managers running XP don't even realize support is ending, and they are going to have to shell out for premium support for security holes. But it now looks certain that a large percentage of XP users still won't be upgrading any time soon. Certainly if you're running an enterprise XP system, you may have postponed an upgrade for too long to ensure an orderly transition – although resellers will be happy to help.